Square's Mike Fischer explains why he's taking a risk on Sleeping Dogs. First, let's talk about the game's tumultuous history. It started life in 2008 as an unnamed project from ModNation Racers developer, United Front Games. Around the same time, Activision canceled True Crime 3 after the arse-poor performance of the bug-ridden True Crime: New York City. Rather than abandon the franchise completely, Activision decided to re-brand United Front's project as True Crime: Hong Kong, but after a series of delays and budget issues, that game was canceled, too. Then, Square Enix swooped in and picked up the title, but not the rights to the True Crime name. Thus, the game was renamed Sleeping Dogs. Now, Square Enix's Mike Fischer is questioning why Activision dropped it in the first place. "I can't speak to why [Activision] let that go. I'm not going to speculate on their behalf," he told Venture Beat. "All I know is, they've gotta be crazy. Because this game is just fantastic. The scale and scope of the game really encompasses all of everything you'd want to do in Hong Kong. The acting, the story, the characters are very deep." Activision passed on the title because the company didn't believe there was a large enough profit margin to warrant its troubled development. That, apparently, isn't a problem for Square Enix. According to Fischer, the company makes enough bank on its triple-A blockbusters to allow him some leeway for experimentation in the NA market. "The great thing for me is, because I have the benefit of these massive triple-A blockbusters," he said. "I don't have to try to replicate that. So I can go out and sort of seek lower-risk, smaller-scale intellectual property investments that obviously I hope will eventually, over time, grow into big franchises of their own." 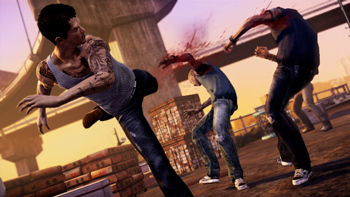 Sleeping Dogs is due to be released on PC, PS3 and Xbox 360 on August 14, 2012.